The Dolomites are unforgettable to anyone who has climbed there or even passed by their steep faces and unexpected shapes. There are innumerable possibilities for climbers there, at all levels of difficulty. Many routes are quite close to the road and allow climbing on high alpine rock walls with a return to hut or hotel and a great meal and a good nights sleep. Climbers normally spend a week or two in the area (sometimes longer). The area is quite complex and made up of a large number of separate groups of peaks and walls. Connecting these groups are winding mountain roads climbing over passes, through beautiful alpine meadows, and descending abruptly deep into valleys. Small towns are nestled in among these peaks. Some, like Cortina d'Ampezzo, are quite well known as beautiful resorts, active in both summer and winter. Generally the best approach to climbing here is to establish a central base in a hotel or camp area, and make excursions from there. Most climbs can be done in a day from the car, but some are best approached from a high alpine hut. A good strategy is to alternate long climbs (which can be very long indeed) with shorter ones or with the occasional via ferrata. The terrain in the Dolomites is steep and complex. But the rock is amazingly featured and seemingly unclimbable walls can go free at only moderate levels of difficulty. There is something for everyone. 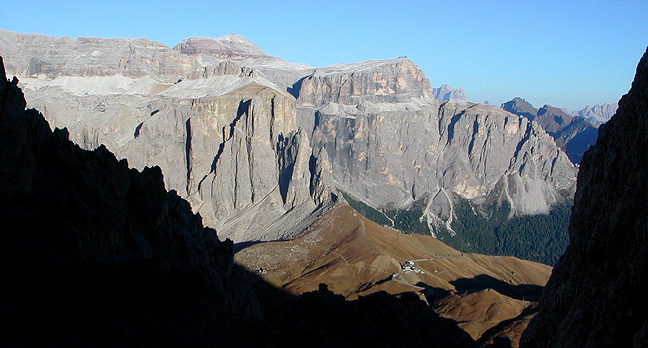 Some classic climbs, such as the traverse of the Sella Towers, can go free at only a moderate grade. There are a great number of routes in the "middle" grades from about 5.6 to 5.9. Whatever you climb, the views, the exposure and the fantastic convoluted topography are unforgettable. There is little permanent snow in the Dolomites and most of the recommended climbs are steep rock routes. 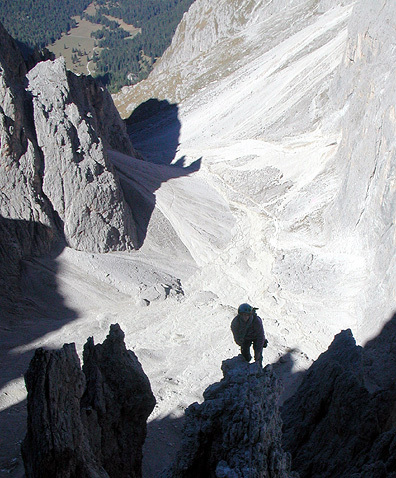 One of the most unusual aspects of the Dolomites are the famous via ferrata. With the aid of metal ladders and cables, these routes ascend cliffs which would otherwise be of extreme difficulty or impossible. They allow access to an exposed high alpine environment which would otherwise be inaccessible to many climbers. We mention a number of routes here which we feel are great classics, though, we have to admit there are thousand of great climbs. Weather and temperature greatly impact route choice. The shady northfacing climbs require fine weather (not uncommon here) to warm up the rock. Sunny south facing routes can be warmed with just a bit of sun. In climbing here the best strategy is to come, perhaps with a short "tick list" in mind, but also being aware that the air temperature could influence route choice. Also, as you climb here, you will continually see great new objectives, and that "tick list" soon gets too long to have much meaning. The best thing is simply to let beauty and fantastic towers inspire you. This is one of the most popular areas in the Dolomites. The approaches are very short, the climbing varied and the verticality of the Towers and surrounding walls very impressive. There are a lot of great climbs here, enough in this one area alone to last a lifetime. 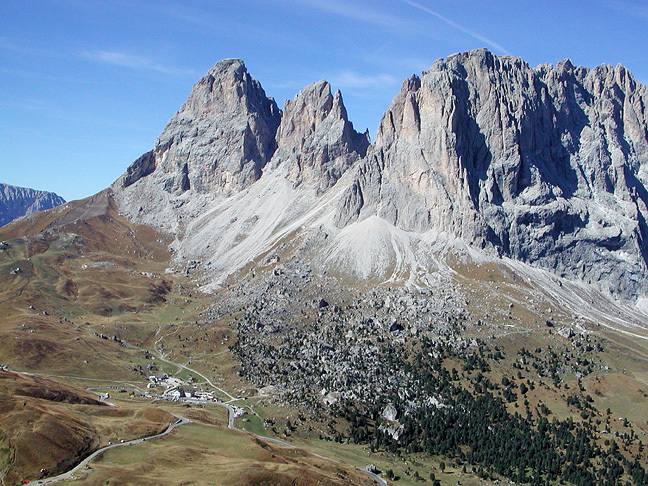 The Towers are approached easily and quickly from the Sella Pass. There are many routes on these towers, climbing them from all sides. A fine traverse can be made by combining the Steger Route (5.7) on the First Sella Tower, the Kostner Route (5.4) on the Second Tower, and the Janweg (5.6) on the Third Sella Tower. All in all this gives about 16 to 18 pitches of climbing. The descent from the top of the Third Tower is complex and exposed, but amazingly easy (if you're on route!). The Tissi is an alternate way to climb the first tower and a worthwhile climb in its own right. It starts with a strenuous wide crack, followed by more steep cracks to reach the upper face. Here the best pitch on the route climbs a golden wall, slightly overhanging, on big holds. There are several pitches rated 5.8+ or 5.9. This is a long climb on the very tall west face of the Third Tower. The first few pitches in this 14 pitch route wander up the lower wall, with very tricky route finding. From the "Spiral Ledge" at half height, the climb takes an impressive crack through a wild overhang, very pumpy 5.8 or 5.9 moves here. More cracks lead to the summit. This is the small group of peaks on the opposite the Sella Towers on the other side of the Sella Pass. One of the best routes we have done in the Dolomites is the traverse of the Punta della Cinque Dita (five fingers). If you do this climb you simply must include the "thumb" which has some of the most exposed climbing we have ever seen. The incredible North Ridge of the Thumb is a vertical knife edge, covered with innumerable huge hand and foot holds. Protection is sparse, but there is no shortage of things to hold onto. The climb is never any harder than about 5.6, but the entire traverse is quite long with about 18 pitches climbed and about half a dozen rappels with a fair bit of complicated down climbing. It is a fantastic and wild ride. 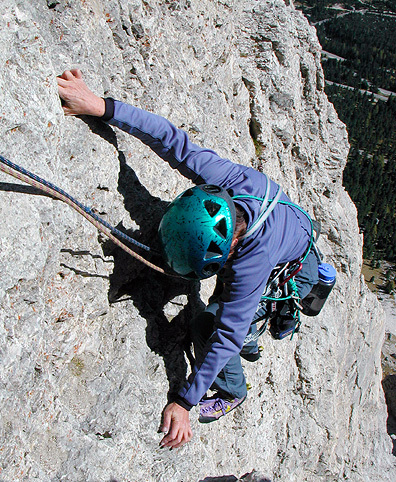 Closer to Cortina this compact group is known for some of the best via ferrata in the Dolomites, and on a fine weekend there are hundreds of enthusiasts scampering over these wild routes. The area also has a large number of ruins of fortifications that date from World War One. There is also great climbing here, as well. The Tofana and neighboring Primo Spigolo di Rozes have two impressive SW facing pillars, very long, on clean rock. The SW Ridge of the Primo Spigolo is about 15 pitches in length and goes at about 5.8. The longer and harder SW Ridge of the Tofana is about 3 pitches longer and 5.9. The Cinque Torri are a small group of giant blocks. There are routes of all difficulties on all sides of this climbers playground. The routes here are short by Dolomite standards, with about 6 pitches being the longest. It is a good place to get used to the rock or simply to have a relaxing day or to push the technical difficulty on harder climbs. This famous area is justifiably popular with climbers of all abilities. One of our favorites here is the Paternkofel, just tothe northeast of the Tre Cime. This fun route has a memorable approach through the World War I tunnels that wind their way up the Northwest Ridge. Descent is by via feratta. Some of the hardest routes in the area are found here with such landmark climbs as the Comici Route on the North Face of the Cima Grande, first climbed in 1933. Fortunately, climbers don't need to venture onto such intimidating walls to have a good time. There are a good number of more moderate climbs, and some even on the warmer south faces. In this area can be found, the Mosca Chimneys on the South Face (5.4), the Dülfer route on the West Face (5.8) and the Spigolo Giallo (Yellow Edge), a famous route at about 5.10+. Also, if you are planning a trip there, be sure to check out the DolomiteSportNetwork, which has tons of great advice, including such essentials are recommended pizzarias, hotels, and even guides!